Grow your business — by generating spectacular reviews and improving your online presence. Make it simple for your customers to leave reviews. Send invitations for customer reviews by text or email. Manually send reviews or automate the process. ZipBooks will automatically send requests to customers after they’ve made a payment. 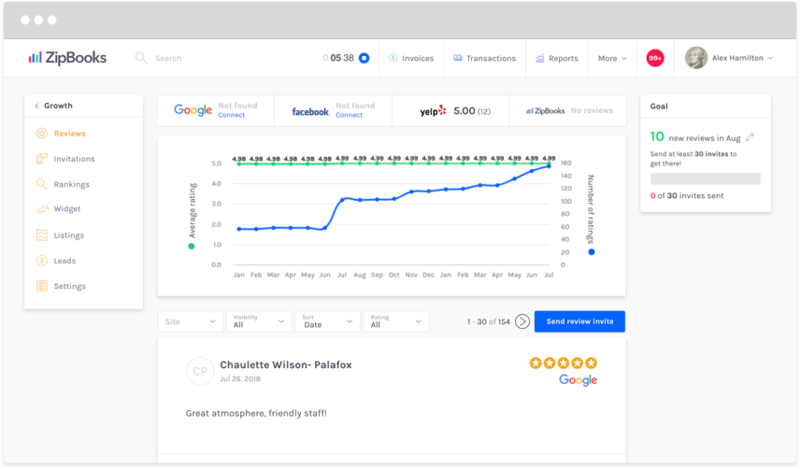 Quickly respond to customer reviews from Google, Facebook, and other platforms from inside ZipBooks. A quick response can help happy customers share their review with others or resolve a complaint before you lose a customer. Use our handy widget to share the reviews ZipBooks collects on your own website. With four options for your website, you can always put your best foot forward.